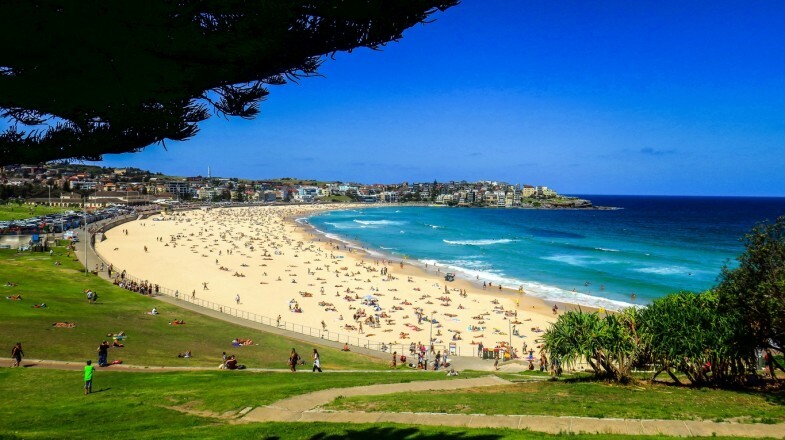 Bondi is the most popular beach destination in Sydney. 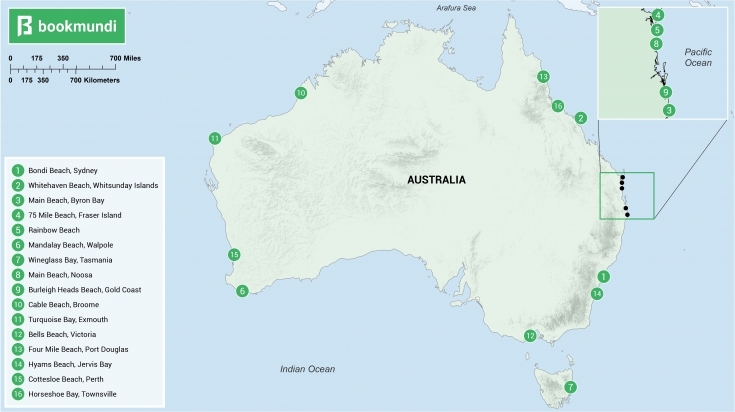 With more than 35,000 km of coastline spanning both the Indian and Pacific Oceans, Australia is blessed with a staggering number of world-beating beaches. Warm, crystal-clear waters lap everything from long stretches of pristine tropical sand to beaches internationally renowned for their surf. Then there are those adored by diving enthusiasts, nature lovers, and even off-road drivers. Here’s our pick of the 15 best beaches in Australia, whatever your interests. There’s something for everyone on Bondi (pictured above) and to visit THE Australian beach destination is to delve into the heart of what it means to be Australian. Beyond the sands themselves there are cafes and restaurants ranging from simple casual eats to sophisticated gourmet experiences. Designer stores line Gould Street, while the short Bondi to Bronte coastal walk offers almost constant panoramic views. Surfers should head to the southern end of the beach, and swimmers to the areas marked out with flags. Location: Just a 30-minute drive, 7 km east of central Sydney. When to visit: Weekdays are best to avoid the crowds, weekends to experience Bondi at its most vibrant. Why go: Explore one of the world’s most famous beach fronts. Whitehaven Beach has perfect, fine white sand. 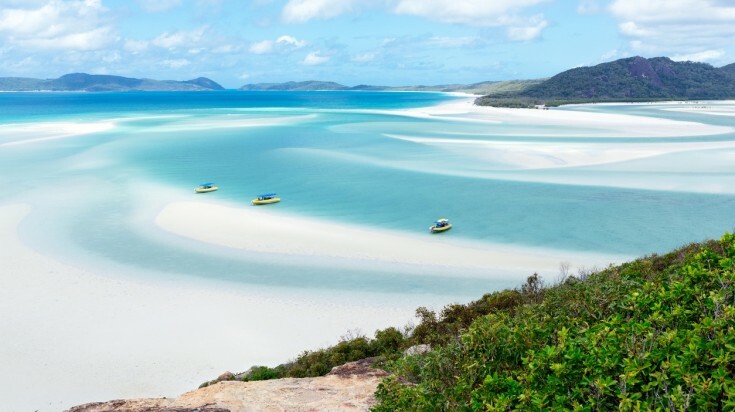 Stretching 7 km on one of the Whitsunday Islands, Whitehaven Beach is known for its near perfect-white and incredibly fine sand, formed out of almost pure silica, as well as its turquoise waters and beautiful surroundings. Comfortable to walk on in bare feet on even the hottest days thanks to the silica makeup of the beach, tourists and locals alike visit for its BBQ lunches, while it’s also possible to camp overnight. 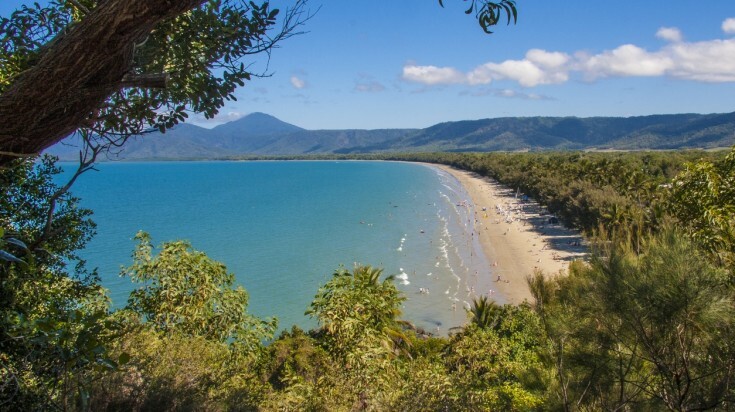 Location: Off the Queensland coast, close to mainland Airlie Beach, which is roughly midway between Cairns and Brisbane. Best time to visit: September and October, when the weather is reliable and humidity low. Why go: Spectacular Aussie BBQs in a wonderful setting. Main Beach in Byron Bay is a phenomenal beach to visit. Byron Bay’s Main Beach can’t claim the popularity of Bondi, but it is still a phenomenal beach to visit. With a relaxed vibe that dates from its era as a hippy hangout, the beach lies close to the easternmost point of mainland Australia. This location makes it ideal for surfing, and attracts board-lovers from across the globe. Location: Byron Bay, New South Wales. When to visit: September to November for reliable weather and low humidity. Why go: Unmatched surfing opportunities. You’ll find 75 Mile Beach on Fraser Island, the world’s largest sand island. Best known for the chance to drive the 120 km length of the beach, other popular reasons to visit are to bathe in the ‘natural jacuzzi’ of the Champagne Pools, get up close to the last pure population of dingoes in Eastern Australia, and for the chance to catch sight of humpback whales. Location: Roughly 4 hours’ drive (250 km) north of Brisbane. When to visit: April or May boast temperatures averaging 23°C, June to August is best for whale watching. Why go: Try out your off-road skills, get up close with dingoes, and bathe in a natural jacuzzi. 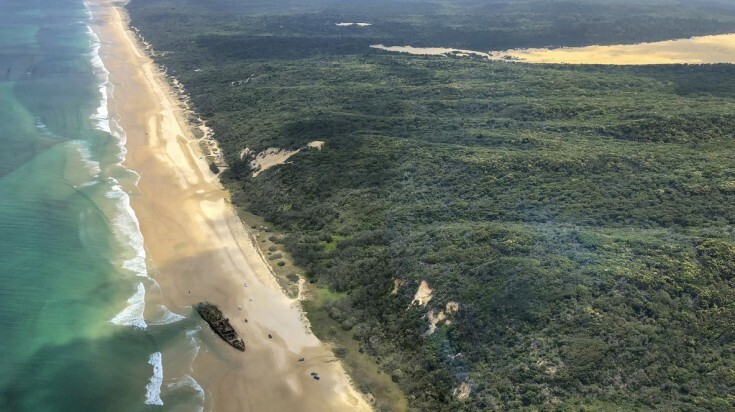 Located in a beachtown of the same name, Rainbow Beach is popular both because of the quality of its sands and also because it acts as a gateway to Fraser Island. 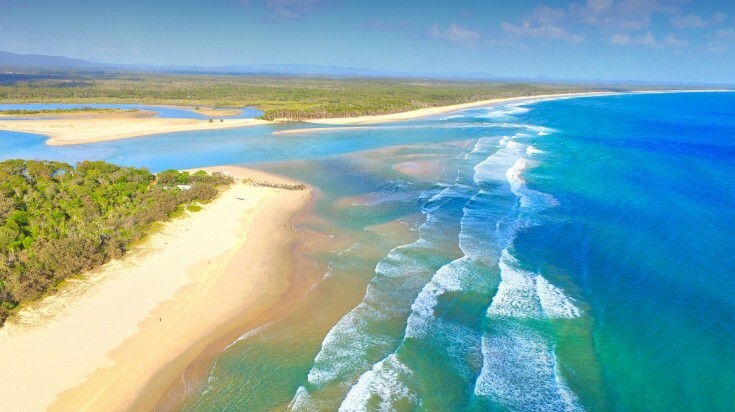 Part of the Sunshine Coast, it is known for its colorful sand cliffs and the off-road route through the Cooloola section of Great Sandy National Park. There’s plenty of outdoor activities on offer by day, including surfing and fishing, and a growing if still low-key backpacker scene by night. Location: 240 km from Brisbane, Queensland. When to visit: September to November, and April to June for ideal weather with minimum rainfall. Why go: The great combination of natural beauty, outdoor activities, and evening entertainment. 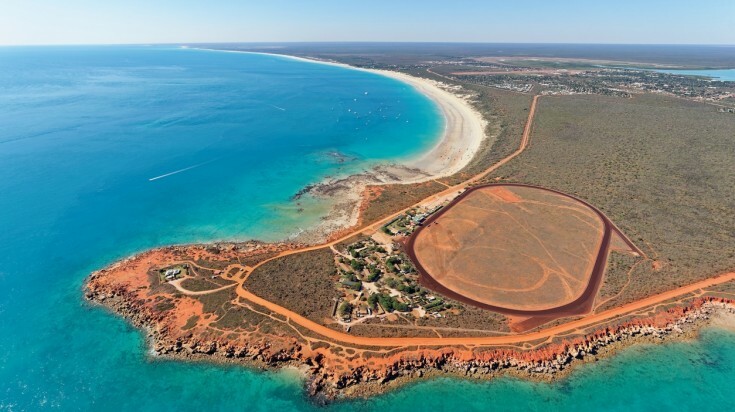 This isolated stretch of beach in Western Australia is one for nature lovers. The rugged beauty of its rocky coastline and the untamed wilderness lining its pale sands makes it one of the most beautiful beaches in Australia. As well as luxuriating in this secluded spot while gazing across at nearby Chatham Island, look out for the 1911 wreck of the Mandalay, from which the beach takes its name. Location: 30 minutes’ drive from Walpole, south of Perth. When to visit: September to November, to avoid the heat of summer from December onwards. Why go: Experience Australia’s western coast at its most natural. Wineglass Bay in Tasmania is a great place to go for a swim. 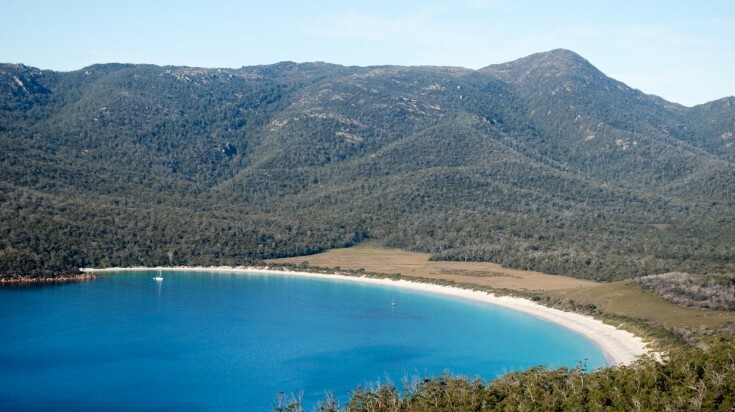 Although Tasmania may not be known for beach holidays in Australia, Wineglass Bay is a definite exception. The near semi-circular white sand beach contrasts spectacularly with the surrounding pink granite peaks and turquoise waters. Protected from the open ocean, it’s a great place to swim and snorkel, as well as try your hand at kayaking. Location: Freycinet National Park, around 3 hours’ drive from Hobart. When to visit: December to February during peak summer. Why go: Take a break from Tasmania’s greenery at this idyllic spot. 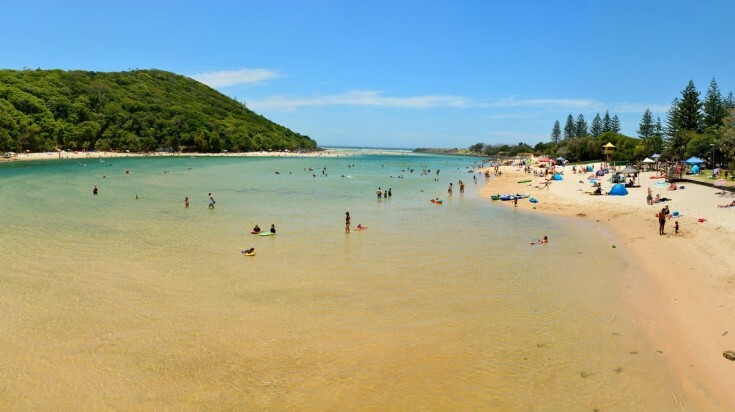 Family-friendly Noosa Main Beach is everything you might expect from an Australian beach. Offering visitors deep golden sand, the sheltered and well-patrolled waters are not only perfect for swimming but also regularly visited by pods of dolphins. The beach has the additional draw of a surfing festival each March. When to visit: September and October for best weather and least amount of humidity. Why go: Family-friendly beach fun with the added lure of dolphin sightings. 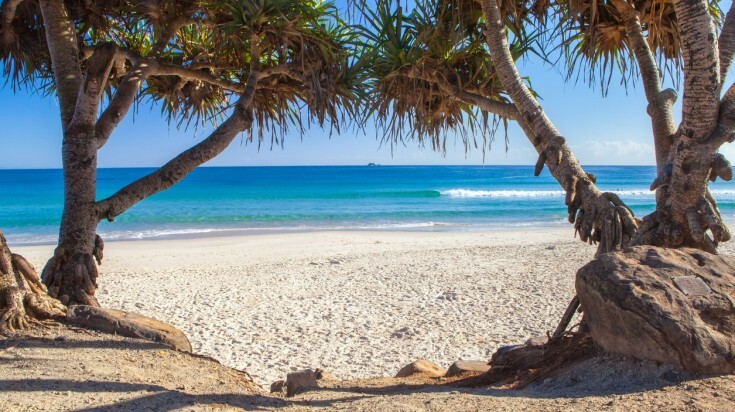 The Gold Coast’s Burleigh Heads Beach manages to combine a great outlook, near perfect conditions for surfing, and a choice of winding hiking trails without the crowds that sometimes take away from the region’s beauty. Several surfing competitions attract competitors from across the globe, while there are also sections for swimmers watched over by lifeguards. When to visit: April and May boast comfortable temperatures and low levels of rainfall. Why go: Take advantage of the Gold Coast’s guaranteed sun without the crowds. A largely untouched stretch of sand edging the Indian Ocean, Cable Beach has made a name for itself for its out-of-this-world sunsets. Grab a drink and enjoy the picture-perfect sunsets from the beach-facing bar, or opt for a camel ride along the beach for a more novel way to experience the nightly event. Cable Beach is also a great place to witness the ‘Staircase to the Moon’ phenomenon, when a full moon rising over mudflats creates the optical illusion of a ladder stretching towards the earth’s nearest neighbour. When to visit: March to October for the Staircase to the Moon (certain dates each month only). Why go: The finest sunsets Australia has to offer. The color of the waters in Turquoise Bay is in no doubt, and the Ningaloo coral reef they house provides fantastic opportunities for snorkelers. Among the array of brightly-hued species, look out for clown fish in the soft coral tentacles, parrotfish, the odd-looking moon wrasse, and reef shark. When to visit: December to February for warm summer months. Why go: Fantastic drift snorkeling. Considered one of the top beaches in Australia for surfing, Bells Beach boasts a powerful surf made up of huge waves. The exposed reef and point break mean its best for those with some experience on a board, although armchair surfers will enjoy the spectacle of world-class surfers battling it out each Easter as part of the Rip Curl Pro Surf Competition. Location: 100 km south-west of Melbourne, Victoria. When to visit: September to May is considered best for surfing. Why go: Quite simply, for some of the best surf the world has to offer. Four Mile beach in Port Douglas is a fine stretch of golden sand. 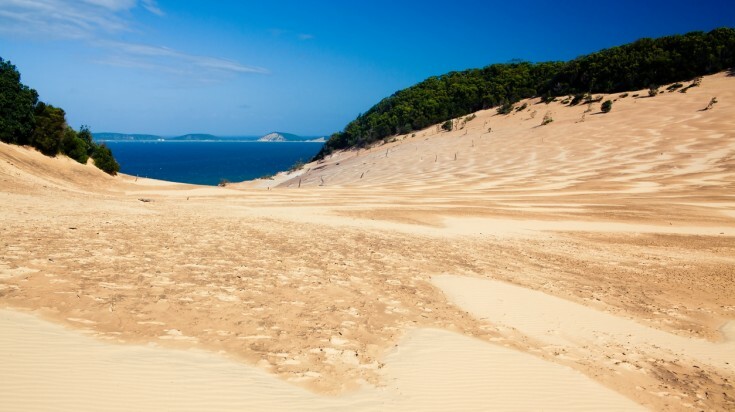 This long run of sand in the north of Queensland on the Coral Sea begins at the base of Island Point and continues to the rocks of the Mowbray River. It’s a particularly impressive sight at low tide, when it can be an extra 200m walk to the water’s edge. Patrolled by lifeguards at its northern end, a net protects swimmers from jellyfish. Location: Port Douglas, 70 km north of Cairns. When to visit: Dry season of March to October. Why go: A great swimming beach surrounded by unspoiled rainforest. Situated around Jervis Bay Marine Park and Booderee National Park, the white sands of Hyams Beach has long been the playground for wealthy Sydney residents. However, anyone is able to enjoy diving and snorkeling here, while kayaking, sailing and whale watching are all other popular activities. What’s more, hikers will love the bushwalks possible through Booderee National Park. Location: Jervis Bay, New South Wales, 200 km south of Sydney. When to visit: March to May, or June to August for whale watching. 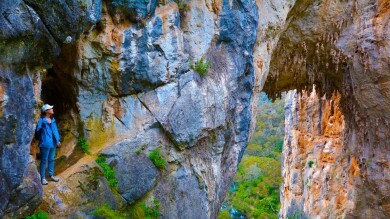 Why go: Incredible nature close to Sydney. 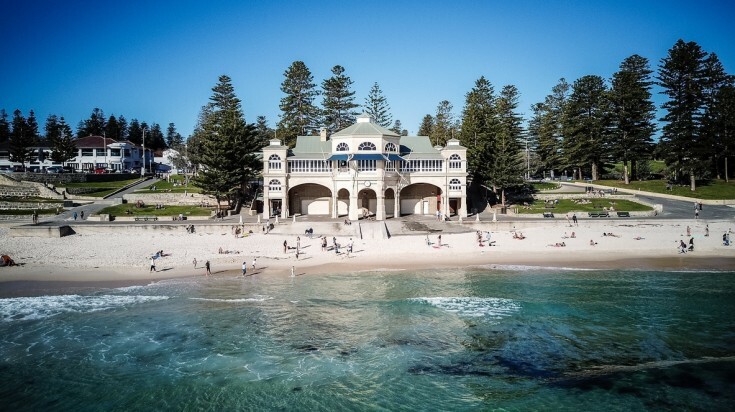 The Cottesloe Beach is a favorite among locals of Perth. Cottesloe Beach’s white sands have been a favorite with the locals of Perth looking to swim, surf and snorkel for more than a century. Keeping your feet dry, the beach offers the perfect place from where to watch the sunset, while each March the beach is turned into an open-air art gallery for the Sculpture by the Sea exhibition. Location: Halfway between Perth and Fremantle, Western Australia. When to visit: Summer and spring months from October to April. Why go: Great swimming and superb art. The beach on Horseshoe Bay is a great place to head to for fans of warm tropical waters, with everything from the more genteel pastime of reef cruising to full-on adrenaline-filled jet skiing on offer. Bird-lovers should look out for the likes of the Jabira, Nankeen night heron, and Brolga. Location: Magnetic Island, off Townsville, Queensland. When to visit: July and August when the water temperatures are warm. Why go: Watersports and bird-watching. 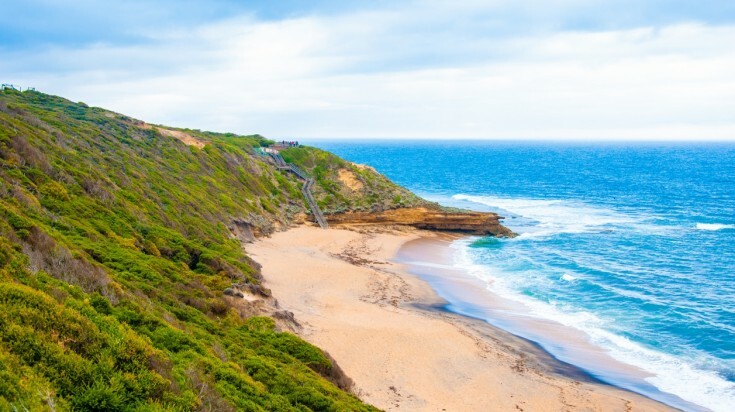 In many ways Australia is synonymous with its beaches, so why not enjoy all they have to offer, from walking and whale watching, to surfing and art installations, with our pick of the best beaches in Australia.